Shaquem and Shaquill Griffin. Credit: Kirby Lee, USA TODAY Sports. The Denver Broncos offensive has long been a weakness of the team. 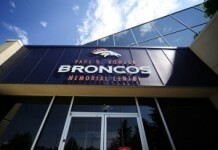 But, they’re not only finally coming together as a unit, they’re also facing an extremely young Seattle Seahawks defense this Sunday, when each teams’ season kicks off, at 2:25 p.m. MST. Gone are the days of the “Legion of Boom,” they’re now being called the “Legion of Who” across the NFL. All told this week, five should-be starters will likely be out while notable rookie Shaquem Griffin will get the start in place of K.J. Wright. Gone is Richard Sherman, as is key defensive lineman Michael Bennett. Although, the reporting of safety Kam Chancellor to Seattle’s training facility on Tuesday is good news for them, as is the ending of Earl Thomas’ lengthy contract holdout. While Thomas and Chancellor have been key members of the team for many years, they may not be able to hit the ground running and play at their usual high level against the Broncos this week. That’s partly because they haven’t been working out and studying with their teammates on a day-to-day basis, and there’s a new defensive coordinator in the Pacific Northwest in Ken Norton. 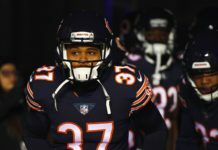 In fact, Chancellor may not play at all this week against Denver and Carroll declined to comment whether he would or not. Per the Seahawks official depth chart, neither Chancellor nor Thomas are slated to start. Instead, Bradley McDougald, a six-year veteran who took over for Chancellor after his injury last year, will start at safety. As will Tedric Thompson, an extremely young safety who played in just nine games last year as a rookie. On the back end of Seattle’s defense, without Chancellor, Thomas and Sherman, we could see Case Keenum have a field day throwing to Demaryius Thomas, Emmanuel Sanders and the Broncos rookie receivers. Shaquill Griffin, a talented second-year cornerback, will have the task of covering one of the Broncos’ dynamic duo of receivers. At 6′ and 198 pounds, he possesses solid size, and his rookie campaign of 50 tackles, 15 passes defended and an interception shows his ability to play at the highest of levels. So, keep an eye on No. 26. In the middle of their defense, Seattle will be missing out on key, veteran defender K.J. Wright, who’s already been ruled out of the game against Denver. Wright had arthroscopic surgery in his knee about two weeks ago, forcing him to the sideline. 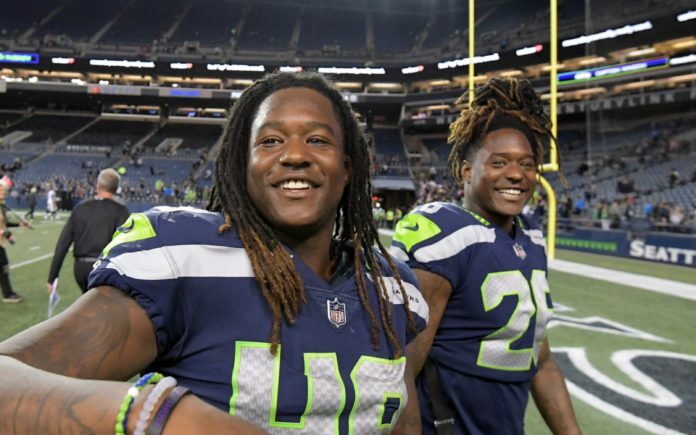 That means Shaquem Griffin, the one-handed wonder, will get the start at outside linebacker against the Broncos. He’s also the twin bother of Shaquill, the starting cornerback this week. Griffin may only have one hand, but he was still an excellent tackler at the college level and his speed (4.38 40-yard dash) allows him to rush around the edge with a quickness. He’s a hard-hitter, although he only weighs 227 pounds. If Denver’s smart, they’ll run right at him with those power plays — pulling a guard or tackle — to kick him outside and let Royce Freeman run wild. On the other side, it’ll be four-year veteran Frank Clark, a 6’3″ and 265-pound lineman who will be putting pressure on Keenum. In 2017 Clark had 10 sacks, and he racked up nine last year; Garett Bolles better be ready for the challenge this week. Overall, Seattle’s starting front four averages four years in the league, with eight-year pro Tom Johnson being the elder statesman. The 285-pounder came over from Minnesota and guards Connor McGovern and Ronald Leary must be licking their chops thinking about blocking him, considering he’s much smaller than many tackles. Normally, the way Seattle’s played defense over the last few years, playing them first on the schedule is a scary proposition for teams. But, it seems Denver got the Seahawks on a good week for the Broncos, as their defense will likely be without five starters from 2017. 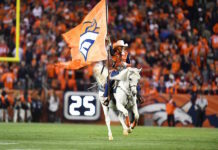 This could be the perfect week for the Broncos new offense, with their new quarterback and rookie running back, to gain confidence and enter the season on a high note.